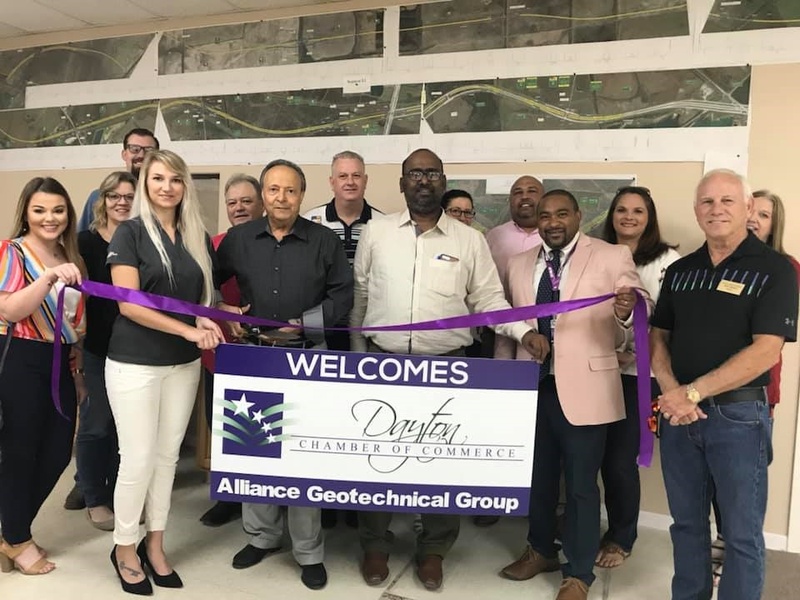 Alliance Geotechnical Group is excited to announce the opening of our new Dayton office, located at 201 North Winfree Street in Dayton, Texas, serving the Greater Houston area! Mr. Niranjan Reddy, P.E. will serve as the Dayton Office Manager. Mr. Reddy is a registered Professional Engineer, registered in Texas and Louisiana and has more than 20 years experience in Geotechnical, Environmental Engineering, Construction Material Testing and Civil Engineering. Key responsibilities include project scope and cost development, project management, project supervision, interface with construction design team, and client interaction and development. Mr. Reddy has provided manager supervision of testing and inspection of excavation, densities on select fill and backfill placement for building pads, parking subgrade and utilities backfill, soil stabilization, retention system, reinforcing steel, large mat placements, high strength and normal strength concrete, shallow foundations, drilled and shaft foundations, pile foundations (timber, h-piles, auger cast piles), post tension foundations, utilities (waterline, storm and sewer lines), lift stations and pavements. In addition, Mr. Reddy has provided QA/QC management for maintaining the American Association of Laboratory Accreditation (A2LA), and conducting QA/QC audits on bi-annual and annual basis for A2LA..
AGG is Named NCTRCA's 2017 DBE of the Year!! We are proud to announce that AGG is once again the recipient of the DBE Firm of the Year for 2017 from the North Texas Regional Certification Agency (NCTRCA). This award recognizes the ingenuity, creativity, tenacity, and hard work of local companies that are successfully competing and succeeding in the marketplace. Alliance Geotechnical Group can now evaluate the structural integrity of existing and new drilled shafts, driven or auger-cast piles and determine the length of existing deep foundations with Sonic Echo/Impulse Response test and Crosshole Sonic Logging. Sonic Echo/Impulse Response test is a nondestructive test that measures the reflection of compressive waves sent through a medium, such as concrete and wood, that can be analyzed to determine structural defects along the shaft (such as bulging, necking, cracks, soil intrusions). This test can also determine soft bottoms caused by cave in or loose materials that were not thoroughly removed during the drilling operations. Crosshole Sonic Logging is a more accurate method to determine defects within drilled shafts or other concrete structural members such as slurry walls, mat foundations, etc. CSL test consist of pre-installing access tubes, PVC or Steel tubes, to the reinforced steel cage for a transmitter and a receiver to be lowered into the tubes after the concrete is placed. The transmitter, lowered in one tube, pulsate ultrasonic waves to the receiver, lowered in another tube, and readings can be recorded every 2 inches for the full length of the access tubes. These tests are beneficial and can minimize doubts on the structural integrity of slurry drilled piers, cased piers or driven piles. AGG’s Longview office has moved! 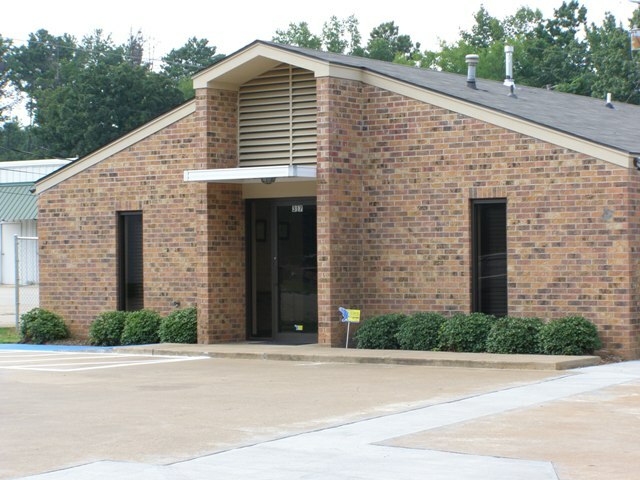 The new office is located at 317 W. Harrison Road. The new 3,500 square foot facility includes a temperature-controlled, fully equipped laboratory and receiving area. AGG maintains state-of-the-art full service in-house laboratory facilities for conducting testing on soils, concrete, aggregates, and asphalt. The laboratory is equipped with new, modern testing equipment, which is routinely calibrated and maintained in quality working condition. All testing is performed in accordance with applicable testing standards, including ASTM, TxDOT, AASHTO, and others. 2013 DBE of the Year! 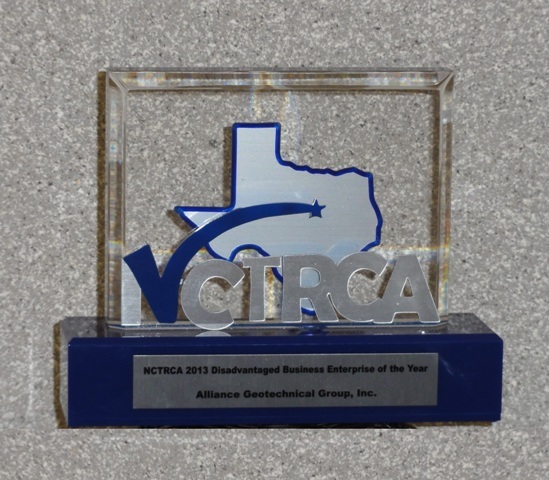 We are proud to announce that AGG is the recipient of the 2013 DBE Firm of the Year from the North Texas Regional Certification Agency (NCTRCA). 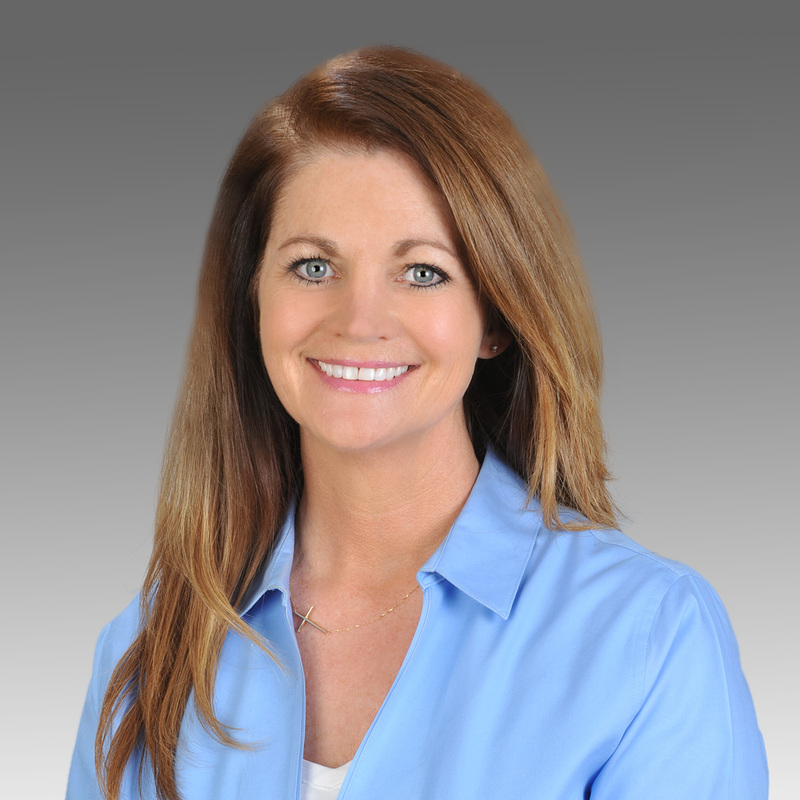 Alliance Geotechnical Group (AGG) is pleased to announce that Dixie Cawthorne has joined the firm as Business Development Manager. With a proven reputation of serving government and the engineering profession, she is known for bringing solutions and value to organizations and the communities we serve. Dixie brings Alliance a proven track record in strategic planning, public relations and client relationship management. She has leveraged her education and training in communications into business development and marketing roles that improves public and private infrastructure. Dixie earned a B.S. in Psychology from Texas Women’s University and a Masters in Public Administration from the University of Texas at Arlington. She actively participates in professional organizations promoting knowledge and best practices within the architectural, engineering and construction community. She has served on the Board of Directors for the Dallas Chapter of the Society for Marketing Professional Services (SMPS), the Public Relations Committee for both ACEC Dallas and Tarrant County Chapters, Public Relations Committee for Texas Public Works Association (TPWA), the Women’s Transportation Seminar (WTS) and the Board of Directors for Women in Sales Executive Roles (WiSER). Dixie can be reached at 972-331-8821, by email - dcawthorne@aggengr.com. Alliance Geotechnical Group acquires Longview based MTE, Inc.
Alliance Geotechnical Group (AGG) is proud to announce the acquisition of Longview based MTE, Inc. The recent purchase allows AGG to continue to expand its services into East Texas, while increasing their staff of experienced professionals and well trained technicians. MTE, Inc. was formed in April 2002 out of genuine concern to provide the East Texas area with full range services in both geotechnical engineering and construction materials engineering and testing, while maintaining the quality goal under the direction of the principals. AGG and MTE have enjoyed a good working relationship for more than 11 years, having worked together on numerous projects. 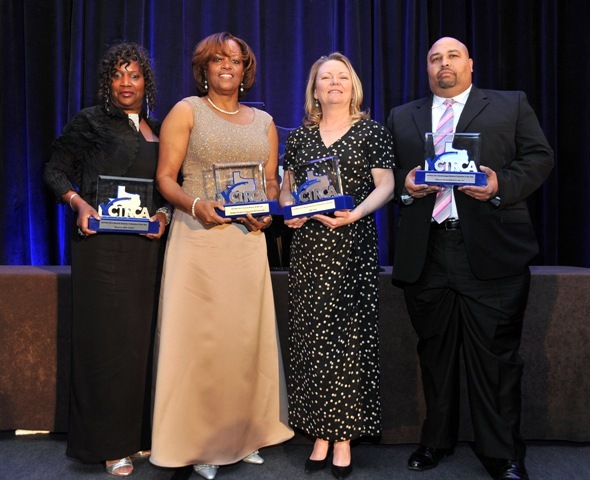 In addition, the senior staff members have worked closely for more than 24 years. Terry W. Oswald, P.E. will continue to manage geotechnical and construction materials engineering and testing projects out of the Longview, Texas office. Mr. Oswald has significant experience in geotechnical and construction materials engineering and testing. His project experience includes geotechnical investigations and construction materials engineering and testing services for airports, roadways and bridges, residential and commercial structures, school facilities, correctional facilities, water and wastewater facilities, utility line improvements, and numerous others. AGG maintains its corporate office / laboratory in Dallas, with a fully staffed office / laboratory in Longview. AGG maintains full service in-house laboratory facilities for conducting testing on soils, concrete, aggregates, and asphalt. The laboratory is equipped with new, modern testing equipment, which are routinely calibrated and maintained in quality working condition. All testing is performed in accordance with applicable testing standards, including ASTM, TxDOT, AASHTO, and others. 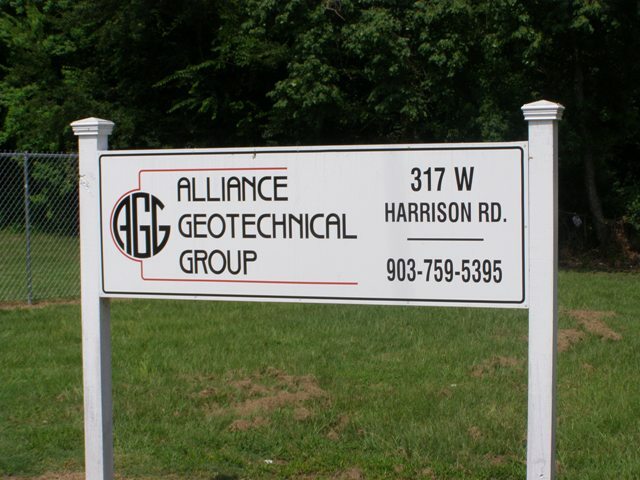 Alliance Geotechnical Group, Inc. (AGG), founded in 1999, is definitely a major contender in the field of Geotechnical Engineering and Construction Materials Engineering and Testing Services in the Dallas / Ft. Worth Metroplex and the state of Texas. The company's phenomenal growth can be attributed to a combination of quality personnel, extensive knowledge and exposure, customer service and great clients. Alliance Geotechnical Group held a ground breaking ceremony on September 3, 2012 to kick off the 4,000 sq. ft. building expansion of our current 15,000 sq. ft. facility. The project is structured to enlarge our testing laboratory in order to allow the growth of AGG in key areas needed for successful development and to bring a more balanced and disciplined approach toward ongoing and new projects. Quality of services is the key issue attained in achieving the highest possible standards for diversified and innovative projects. The laboratory expansion will allow additional state-of-the art equipment for added support to serve and meet the unique needs of our clients with the best-of-knowledge, experience and equipment. The building expansion is scheduled for completion in January 2013. After construction is complete, AGG plans to host an open house to welcome existing clients and potential clients to tour our new facility. Alliance Geotechnical Group is one of the few laboratories in the United States that performs the Abrasion Resistance of Concrete (Underwater Method) (ASTM C-1138M). This test method covers a procedure for determining the relative resistance of concrete (including concrete overlays and impregnated concrete) to abrasion under water. This procedure simulates the abrasive action of waterborne particles (silt, sand, gravel, and other solids). 1. This test method is intended to qualitatively simulate the behavior of swirling water containing suspended and transported solid objects that produce abrasion of concrete and cause potholes and related effects. 2. This test method should provide a relative evaluation of the resistance of concrete to such action. 3. The results are expected to be useful in selection of materials, mixtures, and construction practices for use where such action is to be expected. 4. The test method is not intended to provide a quantitative measurement of the length of service that may be expected from a specific concrete. The test specimen shall be cylindrical in shape, having a diameter approximate 6-mm (1/4-in.) less than that of the inside diameter of the test container and a height of 100 ± 13 mm (4 ± ½ in.). It may be molded from freshly mixed concrete or cored from hardened concrete. Cores shall be taken in accordance with Methods C42/C42M. 1. Place the specimen in the test container with the surface to be tested facing up and the seating blocks in place. 2. Position the specimen so that its surface is normal to the drill shaft and the center of the specimen coincides with the drill shaft. 3. Mount the agitation paddle in the drill press. The bottom of the agitation paddle shall be 38 ± 5 mm (1 ½ ± ¼ in.) above the surface of the specimen. 4. Determine and record the mass of the abrasive charge to the nearest 10 g (0.02 lb). Place it on the surface of the specimen and add water of the same type as used in the saturation period to 165 ± 5 mm (6 ½ ± ¼ in.) above the surface of the specimen. 5. Start paddle rotating and check that the paddle is rotating at the required speed with the paddle immersed. 6. Remove the specimen from the test container at the end of every 12 h of operation. Flush off the abraded material and surface dry. Determine and record the mass of the specimen in air and in water. Please see the abstracts below. Please contact Mr. Farrow for more information. 7. Slab-On-Grade Foundations: State of Art / Confusion?